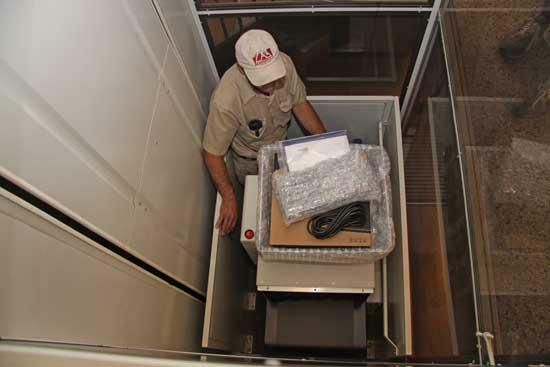 The new x-ray machine for security at the Cannon County Courthouse is lifted up the elevator Monday. Thanks to a grant made possible under the American Recovery and Reinvestment Act (ARRA), there is new security in place for the courtroom of the Cannon County Courthouse. Cannon County Sessions Court Judge Susan Melton and County Executive Mike Gannon applied for the grant through the Supreme Court of Tennessee, Administrative Offices of the Courts (AOC). The AOC provided Cannon County $20,489 through funds made available by the ARRA for the specific purpose of purchasing and installing an x-ray machine. The x-ray machine was purchased through Bankpak Inc. of Morrison, TN and was installed Monday outside the entrance to the courtroom by AUTOCLEAR. AUTOCLEAR manufactures and sells a complete line of x-ray security and metal detection solutions, including x-ray scanners and metal detectors for airport, government buildings, schools and public facilities security, people screening and much more. Gannon said Monday the grant he and Judge Melton applied for included a request for security cameras, but that portion of it was denied. He added they hope to have the opportunity to reapply for a grant for the cameras at a later date, should the funding become available.